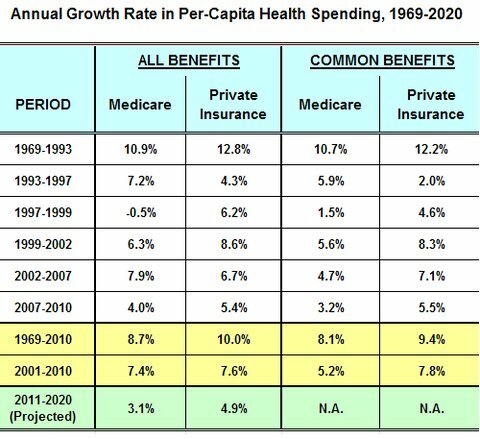 As you can see, costs have actually grown more for private health insurance than for Medicare. And when you compare only those portions of health costs that are typically covered by both Medicare and private health plans, Medicare looks even better. Reinhardt points out that the two common critiques of the above data are 1) cost-shifting from Medicare onto private insurers, and 2)Medicare covers different things than does private insurance. As you can see in the "common benefits" section of the table, (2) is plainly false. And plenty of economists have tested (1) empirically, and found no credible evidence that Medicare is pushing the costs of its enrollees onto private insurance plans--yes, there is a price differential, but this is merely price-discrimination, not a rise in private insurance costs being caused by a decline in Medicare reimbursements. The data actually says that neither Medicare nor private insurers have been able to prevent health care spending from skyrocketing. This is not terribly surprising. Perhaps this is a good time to mention that there are two types of healthcare spending increases: there is a good kind, and a bad kind. The good kind of spending hike is one caused by the fact that advances in medicine are outpacing advances in the rest of the economy, which causes us to devote an increasing proportion of our resources to healthcare. This is good in many ways: for one, it is a major source of income and jobs growth, since healthcare is now one-fifth of our entire economy. But more importantly, it means that people live longer and better. So why are we so worried about skyrocketing healthcare spending? That's because everyone is assuming that the increase in costs reflects mostly the bad kind: where we pay more for the same outcomes. This kind of spending actually decreases GDP relative to what it would be otherwise, because it implies that we are wasting an increasing share of resources on the same level of output. The US medical system certainly has its fair share of wasteful spending--more, in fact, than any other country. But I'm not convinced that this is driving the increase in healthcare costs overtime, since that would require assuming that the amount of waste is increasing overtime. I think a more realistic description of reality is that the high level of healthcare costs americans pay is due to waste, but the increase in healthcare costs primarily reflects innovations in healthcare technology. Thus, I would caution people against rhetoric about runaway healthcare spending. It is mostly the good kind.